On the very day the rest of us were mourning another killing of NYPD Officer Randolph Holder, felon on probation, corrupt cop Bernard Kerik was making photo-ops with former Attorney General “Just Say No” Edwin Meese, gabbing to the press for his dark money “nonprofit” funneling ACCJR.org and doing lunch with a group of “Law Enforcement Leaders”. Back in New York City, the New York Post was reporting the accused shooter of slain NYPD Officer Randolph Holder should have been in prison. The article explained the judge opted to be “soft” on the thug sending him to a rehab center instead of prison on previous charge. The painful irony of the day’s events went all but unnoticed by the press except for a Huffington Post tweet. It calls into question the politics and money of Criminal Justice Reform as both law enforcement and bad guy apologists like Koch Industries and FAMM Foundation lobby and maneuver for the lucrative bi-partisan support and exposure. I did notice the conspicuous absence of former Mayor Rudy Giuliani. Why a seemingly legitimate group of cops like “Law Enforcement Leaders to Reduce Crime and Incarceration” @LawLeadGroup would want to be members of a group where a Felon on probation, corrupt cop, Bernard Kerik, is a member? 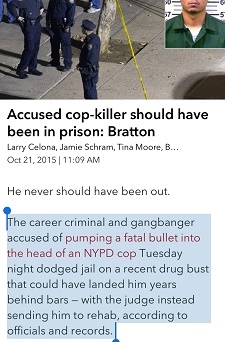 Felon on probation, corrupt cop, Bernard Kerik is neither a “law enforcement profession” nor a “leader”. Bernard Kerik is no longer a law enforcement professional. He traded the public trust so he could do lunch, make money (much like he’s doing now), cheat on his taxes and his wife, Hala Kerik. 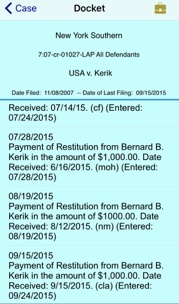 Felon Bernard Kerik is still on probation, denied early release and still owes the USA $180,000 in back criminal restitution! Bernie Kerik has money to travel, dine with the boys in fancy Washington DC restaurants but only pays $1000 month toward the six figure outstanding criminal restitution to the USA! Kerik is no leader. He reportedly manipulated $93000 from a woman while he was in prison, alleged to have taken her writing and made money publishing it without her permission, credit and compensation! Corrupt cop, felon on probation, Bernard Kerik is unrepentant in he has NEVER, since his release from prison, uttered the words "I’m sorry" or “I was wrong”. Corrupt cop, felon on probation, Bernard Kerik, to this very day, apparently continues to lie and manipulate those who have trusted and helped him along the way. Edwin Meese should be ashamed to pose with a crook like Kerik. The “Law Enforcement Leaders to Reduce Crime and Incarceration” have done nothing but eat lunch and get their picture took so they probably deserve corrupt cop felon on probation Bernard Kerik. ….And NYPD Officer Randolph Holder is still dead at the hands of a thug that should have been in prison but was released because we don’t want to appear “soft on crime”. 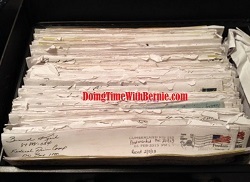 Thanks for the cover, Bern.